Wow, what a delightful year for lovers of good Hindi movies! Four of the six movies last reviewed here have been low budget gems that also made good, pointing to a crumbling of the studio oligopoly that has existed in Bollywood for years. Three of those have been set in Mumbai, a city whose encompassing moods and multiple layers of existence have been rich fodder for young writers and directors. While Jaane Tu dealt with romance in the hip, sophisticated side of this cosmopolitan city and Rock On was a coming of age movie set in the comfort of urban success, A Wednesday looks at the seamy side of Mumbai, where gangsters and politicians co-exist in relative amity, where the man on the street is just a pawn in the complex games of the powers-that-be. 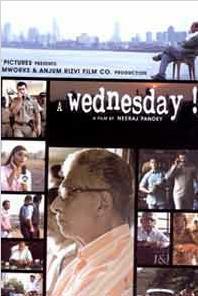 A Wednesday has been unfairly clubbed with other movies dealing with bomb blasts in Mumbai. Terrorism is a subject that goes deep into the psyche of the average Mumbai resident and it is not surprising that different filmmakers try to deal with it in their own unique way. But this particular movie is not a commentary on the issue like Mumbai Meri Jaan or Tahaan. What it is, first and foremost, is a tight, taut thriller, a cat and mouse game between the police chief, played by Anupam Kher, and an anonymous criminal (Naseeruddin Shah) who threatens to bomb five unknown locations in the city unless his demands are met. The drama plays out in just 100 minutes of movie time( about 5 hours of real time on a Wednesday), but each minute is a cliff-hanger as the terrific script keeps us guessing till almost the very end. The direction by debutant director Neeraj Pandey is impeccable and worthy of the enormous acting talents of Kher and Shah. If I had a quibble, and it is a very small one at that, it is that a couple of supporting actors don’t quite measure up. This is especially true of the guy who plays the Bollywood star threatened by the Mob, but I am really nitpicking now. Given that this is a movie that was probably made on a small budget, this cost-cutting is pretty forgivable. Especially as there are some scenes which could be used for a master class in acting. One in particular is the final scene between Kher and Shah. This is the only time in the movie in which the two share the frame. The freeze frame at the end captures a look on Shah’s face and he manages to convey so much more with just his expression in that one second than reams of award-winning dialogue can do in hours. What is more encouraging than the fact that this is a really good movie is that it is a big hit back home, gaining some kind of cult status among movie fans. It is unashamedly bilingual, with the English dialogue sounding colloquial and appropriate, and has no songs. Isn’t it great that a movie that bucks the formula can do so well? I’ve been feeling lately that there is a renaissance of sorts happening in Bollywood. Studios like Yash Raj Films have been turning out turkeys like Tashan and Thoda Pyaar, Thoda Magic while the indie crowd has been scoring all the goals. Young filmmakers have been making the films they want to make, not the ones they think they should and the results, while not uniformly good,( witness strange creations like Ugly Aur Pagli and Money Hai to Honey Hai), have been interesting. At the very least, this new direction in Bollywood is giving character actors like Anupam Kher, Naseeruddin Shah and Ranvir Shorey their place in the sun. Like movies produced by Miramax in Hollywood, an alternate channel of small, intelligent movies is emerging in India. As an avid Hindi-movie watcher, I can only rejoice. My rating – 4.5 stars out of 5. This entry was posted in Entertainment, Movie Review and tagged mumbai bomb blasts, renaissance in bollywood on October 12, 2008 by vpdot. Absolutely. Friends who are dying to watch intelligent movies are raving about it. Some have even gone and bought themselves the DVD – yes, it is available. Its strongest point? Apart from the tight script, the fact that the director has resisted the temptation to make money through songs-filled audios. Song-and-dance items don’t intrude, slackening the pace. And it is short. Now this is a complete surprise. And an extremely pleasant surprise, must add. Newer stories are slowly finding their way into plexes of India. Its an amazing movie – a must and eye opener for every Indian!!!!!!!!!!! !